Actually, many of the recipes in this book have you use Ziploc bags rather than a vacuum sealer. I asked my local cookbook shop about it, but they hadn't even heard of it yet (apparently MCaH is self published like the first two printings of MC). They tried to inquire through Taschen, but as of yet, no international edition and no international distribution (besides Amazon) is planned, apparently. Copies of MCAH are on their way to Europe and will be distributed to booksellers throughout the UK and Europe by Publishers Group UK and Grantham Book Services. Looks like the Amazon.ca books are shipping - mine just changed from Estimated Delivery October 12 - 16 to Wednesday October 10. Which means it might actually arrive on Tuesday!!!! Mine have already been shipped! 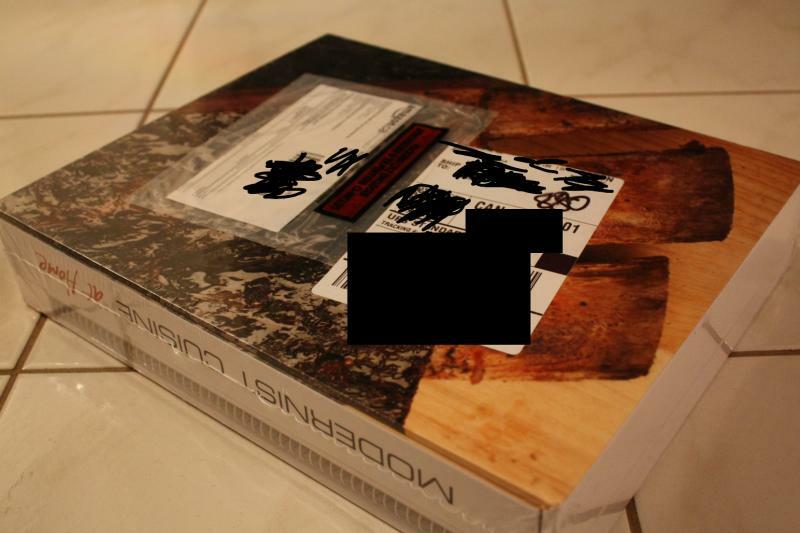 DHL picked it up about 8 hours ago!!!! guess lower 48 ship late! seems to ship by mule team. It's that lowest price guarantee they offer. Mine will arrive on Tuesday it appears - I'd better have chocolate ready for Greg - my UPS guy - he expects it! excellent thinking. price goes up, price goes down, up, down. this is the 'oil futures' of the cookbook industry. Have to find some treat for the mule team. Dont they like Borax or something like that? I tried again and got them to process a refund as a one time exception. Yar AnneN good for you. Wow, wtf is going on with Amazon and the price of this book!?! I've been debating whether to buy it because it's quite a big expense for me, and Amazon is certainly not helping make the decision any easier. I've been tracking the price for a few months now, and kept waiting for the usual Amazon discount off list price. Eventually there was a small discount, which kept fluctuating, then I was hoping that once the official release date came, the price would stabilize. That's certainly not the case! Amazon (US) is now currently shipping it, and the price has changed in the past hour and a half! An hour and a half ago they were selling it at 9% off the list price, now it's back up to $140 with no discount (as of 12pm EST). I buy A LOT of books on Amazon, and I've never once seen anything like this. It's the #419 best seller in all of books on Amazon US right now, so it doesn't seem like they've removed the discount because of slow sales; they usually discount the biggest sellers most because they make their profit from volume. 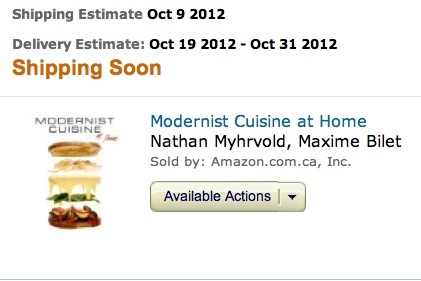 I know this book is unique in its publication method and cost to print, but given Nathan's previous statements on here that he'd be shocked if Amazon didn't offer a discount equal to or greater than that for the original Modernist Cuisine (currently a 26% discount on Amazon), it seems to be a very strange situation. Even Barnes & Noble are offering a greater discount off list price (7%). I'm curious as to how much this is affecting sales of the book? I know I'm going to wait to see what happens over the longer term, especially considering how unusual the situation is. it seems strange, but I believe they only discount if they get a discount from the publisher, which might not be happening here (yet)? They're not gonna take a loss on this book, it's not gonna sell tens of thousands. WSJ sometime ago suggested that there are bots at Amazon that follow prices at other internet sites and adjust theirs accordingly. Just a heads up for those that preordered through Amazon, I received an email (without contacting them) saying they are crediting me for the difference between today's price and the original $140. Amazon comes through once again! My copy is waiting for me at home after work. Hmm, I feel a sore throat coming on. In case you are looking for a lower price, I just got this email. Mine just shipped from Amazon.CA. A bit earlier than I expected too! Got my copy today, but Amazon.ca sent the book-pack to me without a box. They just slapped a UPS sticker onto the shrink wrap and sent it on through. Christ. Now I have to return it and I have to look for a box to ship it back in, to boot! Mine came boxed inside a second box from Amazon.ca. Woohoo. On the way from Canada to Melbourne, Australia. Now I play track that parcel. My anticipation is high (slightly apprehensive my extremely excessive expectation will not be met). MC was a masterpiece. I got a big surprise today when I heard a knock on the door and it was UPS delivering.......MC@H! My hon bought me an early Christmas present! I have been leafing through it and see all kinds of interesting things. I have an IC which I have used quite a bit but do not have a pressure cooker (yet). I do have, I think, all the other equipment the books calls for. So my question is, what should be the first thing I try? Edited to add: Mine did not come in an Amazon box. It came with a label affixed to the shrink wrap but it did arrived unscathed. 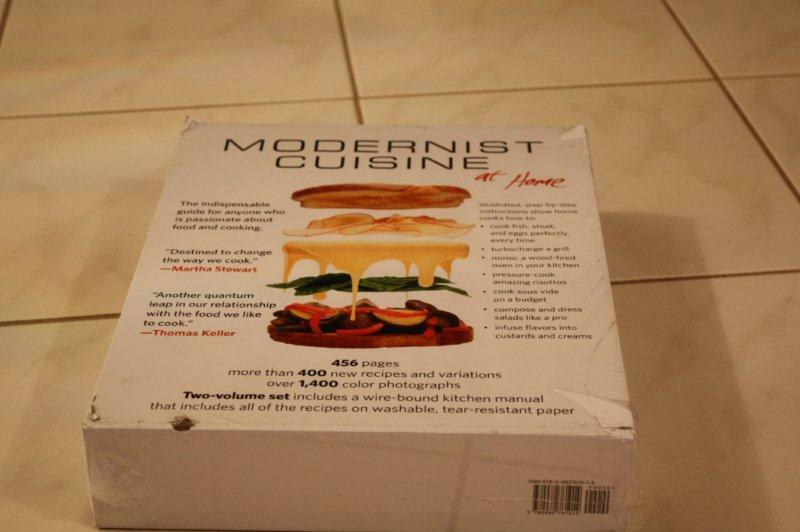 Do you have Modernist Cuisine? ... if not, i'd try that Mac n Cheese first that's a sure fire bet. Was there no box around it at all? Mine have a box with Modernist Cuisine at Home stamped on the outside with a bar code and everything. Kerry, it came in the MC@H "sleeve" that the books fit into but there was no other wrapping i.e. no Amazon box to protect the whole thing. Just the shrink wrap whereas it sounds like yours was shipped in a proper Amazon box.